Rectorseal No.72851 Copper-Rich, Anti-Seize Compound 8 oz. Our Products >> Machinist / Millwright Tools >> Rectorseal No.72851 Copper-Rich, Anti-Seize Compound 8oz. 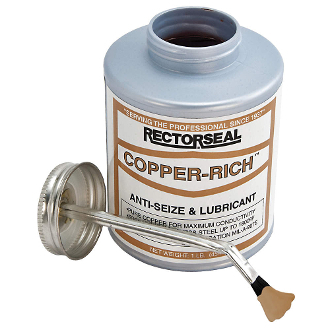 Rectorseal No.72851 Copper-Rich, Anti-Seize Compound 8oz. Rectorseal’s No. 72851 Copper-Rich, is formulated with pure micro-sized copper flakes dispersed in a non-melt, high temperature grease. It’s Resists seizure on all metal connections including stainless steel to 1800 degrees F (982 degrees C). Ideal for use where electrical conductivity is important. Product color: Copper. One 8oz brush top bottle. Highly adhesive on both wet and dry surfaces. Highly conductive, ideal for electrical connections of all types. Resists seizure for easy breakout on all metal connections. For use on stainless steel up to 1800 degrees.